Description: The Bayou Greenway system knits together the region’s urban context and natural environment. 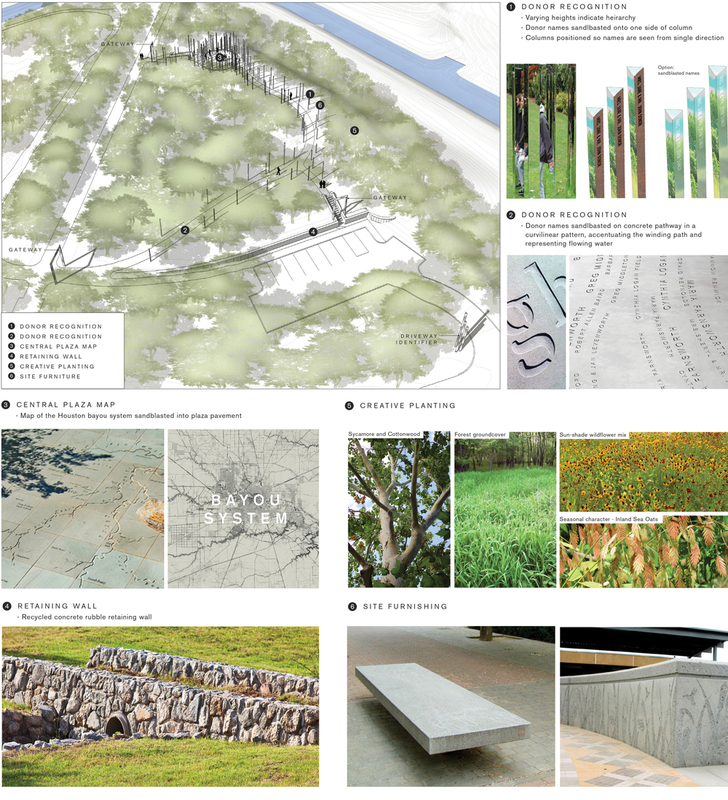 This concept uses ‘reflection’ as a design element to evoke water and the interconnectedness of local civic life, and honors the donors who will be coming together to realize the Bayou Greenways Project. Reflecting Confluence weaves these ideas into a unified spatial experience, evoking the notion of an urban fabric. The design plays on the theme of confluence: as a place where bodies of water flow into each other, as a gathering of people, as a coming together of events and a city. The conceptual options presented within this proposal utilize the movement of park visitors and the varying light of day to create a continually changing visual experience. The design acknowledges the confluence of people, generosity, and vision that are making the Greenways project possible. A simple but striking use of reflection interlaces the natural environment and visitors, self and other. Reflecting Confluence conveys a powerful metaphor of connectedness at the heart of the Houston Bayou system.